Objects in mirror may be more fascinating than they appear. I’m sorry, let me elaborate: physics is really hard. The sharpest minds of our entire species have been hammering away at the fundamental rules of our Universe for the past several hundred years, and while they’ve discovered an incredible lot about the tiniest bits of things that make up… well, everything… it’s still hard. There are still a lot of questions, and a lot to learn and find out, and all of it is just terribly scientific and mathematical and counter-intuitive to anything you might think you know about how stuff works. UPDATE: Read on to find out how to win a free copy of the book! 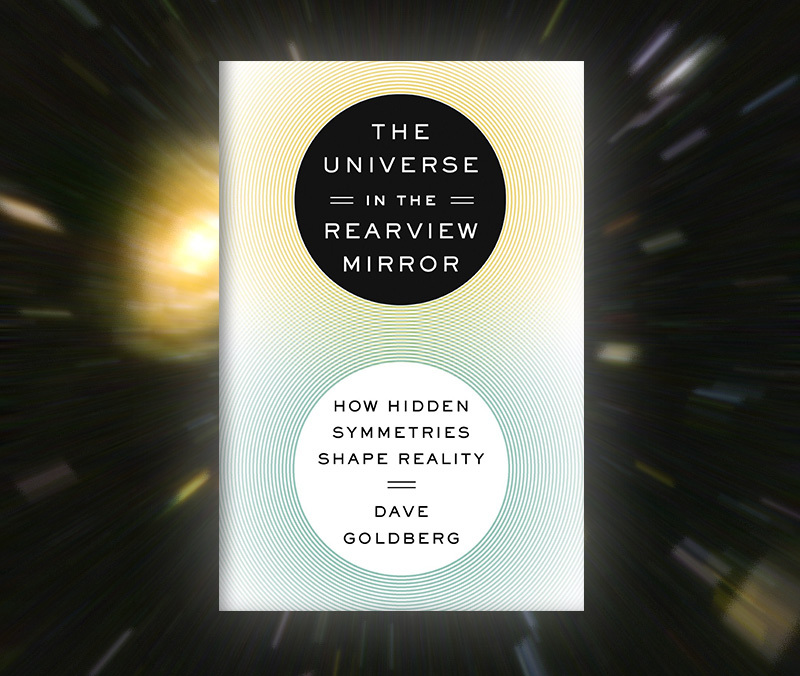 In The Universe in the Rearview Mirror: How Hidden Symmetries Shape Reality (from Dutton) physicist Dave Goldberg delves into the fundamentals of modern physics, describing the behavior, composition, and origins of the smallest and most enigmatic particles we know of — the very ingredients of atoms themselves. From Newton to Einstein and Hawking to Higgs (and an entire chapter devoted to Emmy Noether, the “most significant mathematician you’ve never heard of”) Goldberg discusses the development of particle physics and its theorems of underlying symmetry, and how we know what we know now. Oh, and you’ll love every page of it. Even though the subject matter is undeniably complex and often abstract, Goldberg does a great job at describing it in ways that are not only easy to understand but also shamelessly entertaining. His conversational tone is informative without being condescending (except when he’s specifically trying to be) meaning you’ll be getting the gist of some pretty advanced concepts without feeling like you’re being talked down to… and even when Goldberg trots out the occasional cliché he spray-paints it bright pink and clearly labels it as such. In other words, you’ll learn stuff* and have fun doing it. Because, as the author notes, science should be fun. Why are you made of matter instead of antimatter? Why shouldn’t I teleport a spoonful of neutron star into my cargo hold? And – should your TARDIS leave you stranded – why does the “arrow of time” point one way and not the other? You can also ENTER TO WIN a free copy of the book by emailing jmajor “at” lightsinthedark.com with the subject line “Remember Emmy.” I’ll pick three (3) winners at random on Monday, June 15th to receive a copy in the mail! (U.S. addresses only, please.) NOTE: Contest is now closed. Congrats to the lucky winners! You can follow Dave Goldberg on Twitter here, and read more overflowing praise of TUITRM on the book’s website here. *Does this mean physics is now easy? No, it’s still really hard and makes my head spin… but at least now I know it spins to the left. Still a very good book but that don’t exist in French version… It’s pity !! But perhaps that will be translate in French… one day !! Can’t wait till it’s available at the library!